Spring Boot allows you to quickly develop microservices. 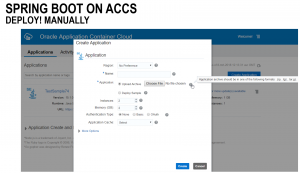 Application Container Cloud Service (ACCS) allows you to easily host Spring Boot applications. Oracle provides an Application Cache based on Coherence which you can use from applications deployed to ACCS. In order to use the Application Cache from Spring Boot, Oracle provides an open source Java SDK. 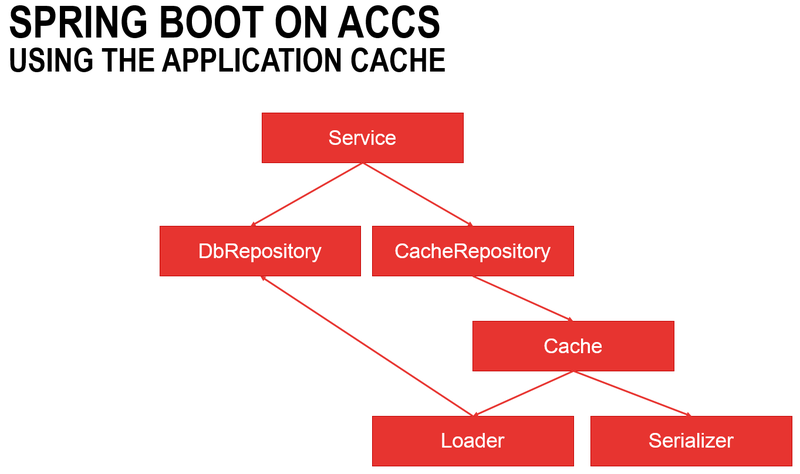 In this blog post I’ll give an example on how you can use the Application Cache from Spring Boot using this SDK. You can find the sample code here. You can use a web-interface to easily create a new instance of the Application Cache. A single instance can contain multiple caches. 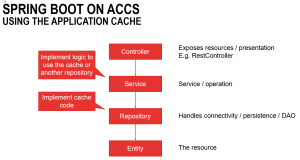 A single application can use multiple caches but only a single cache instance. 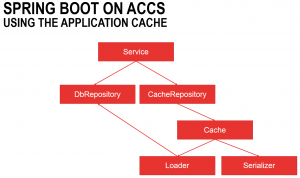 Multiple applications can use the same cache instance and caches. Mind that the application and the application cache are deployed in the same region in order to allow connectivity. Also do not use the ‘-‘ character in your cache name, since the LBaaS configuration will fail. 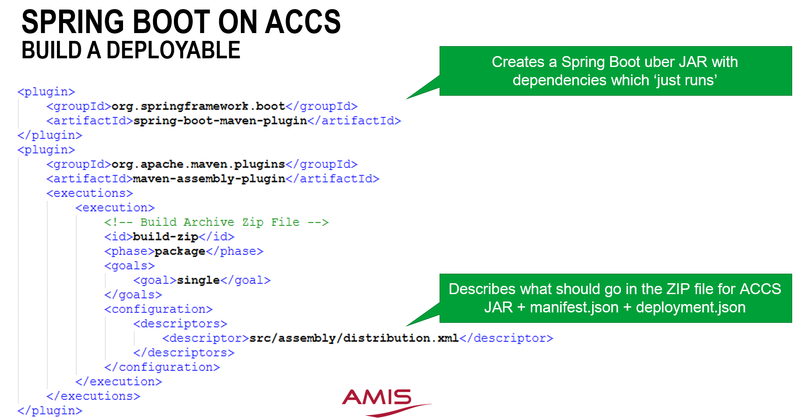 Spring Boot applications commonly use an architecture which defines abstraction layers. External resources are exposed through a controller. The controller uses services. These services provide operations to execute specific tasks. The services use repositories for their connectivity / data access objects. Entities are the POJO’s which are exchanged/persisted and exposed for example as REST in a controller. In order to connect to the cache, the repository seems like a good location. Which repository to use (a persistent back-end like a database or for example the application cache repository) can be handled by the service. Per operation this can differ. Get operations for example might directly use the cache repository (which could use other sources if it can’t find its data) while you might want to do Put operations in both the persistent backend as well as in the cache. See for an example here. In order to gain access to the cache, first a session needs to be established. The session can be obtained from a session provider. The session provider can be a local session provider or a remote session provider. The local session provider can be used for local development. It can be created with an expiry which indicated the validity period of items in the cache. When developing / testing, you might try setting this to ‘never expires’ since else you might not be able to find entries which you expect to be there. I have not looked further into this issue or created a service request for it. Nor do I know if this is only an issue with the local session provider. See for sample code here or here. When creating a session, you also need to specify the protocol to use. When using the Java SDK, you can (at the moment) choose from GRPC and REST. GRPC might be more challenging to implement without an SDK in for example Node.js code, but I have not tried this. I have not compared the performance of the 2 protocols. Another difference is that the application uses different ports and URLs to connect to the cache. You can see how to determine the correct URL / protocol from ACCS environment variables here. The ACCS Application Cache Java SDK allows you to add a Loader and a Serializer class when creating a Cache object. The Loader class is invoked when a value cannot be found in the cache. This allows you to fetch objects which are not in the cache. The Serializer is required so the object can be transferred via REST or GRPC. You might do something like below. Mind that when using Spring Boot you do not want to create instances of objects by directly doing something like: Class bla = new Class(). You want to let Spring handle this by using the @Autowired annotation. Do mind though that the @Autowired annotation assigns instances to variables after the constructor of the instance is executed. If you want to use the @Autowired variables after your constructor but before executing other methods, you should put them in a @PostConstruct annotated method. See also here. See for a concrete implemented sample here. The Application cache can be restarted at certain times (e.g. maintenance like patching, scaling) and there can be connectivity issues due to other reasons. In order to deal with that it is a good practice to make the connection handling more robust by implementing retries. See for example here. In order to deploy an application to ACCS, you need to create a ZIP file in a specific format. In this ZIP file there should at least be a manifest.json file which describes (amongst other things) how to start the application. You can read more here. If you have environment specific properties, binding information (such as which cache to use) and environment variables, you can create a deployment.json file. In addition to those metadata files, there of course needs to be the application itself. In case of Spring Boot, this is a large JAR file which contains all dependencies. You can create this file with the spring-boot-maven-plugin. The ZIP itself is most easily composed with the maven-assembly-plugin. There are 2 major ways (next to directly using the API’s with for example CURL) in which you can deploy to ACCS. You can do this manually or use the Developer Cloud Service. The process to do this from Developer Cloud Service is described here. This is quicker (allows redeployment on Git commit for example) and more flexible. Below globally describes the manual procedure. An important thing to mind is that if you deploy the same application under the same name several times, you might encounter issues with the application not being replaced with a new version. In this case you can do 2 things. Deploy under a different name every time. The name of the application however is reflected in the URL and this could cause issues with users of the application. Another way is to remove files from the Storage Cloud Service before redeployment so you are sure the deployable is the most recent version which ends up in ACCS. Create a new Java SE application. Getting started with Spring Boot microservices. Why and how.